Hillwalking in Scotland is among the best. For more experienced walkers, the Scottish hills and mountains present a challenge, for the inexperienced, a good place to start. The ideal time for taking to our mountains is April to October, as conditions can sometimes be hazardous throughout the winter, from November until March. Our mountains are split into three main groups, the Munros, the Corbetts, and the Grahams, offering an ideal opportunity to explore the great outdoors and see much of the Scottish countryside in all its scenic glory. These are particular favourites for hillwalking in Scotland, with hikers coming from all over the globe to tackle our highest peaks. 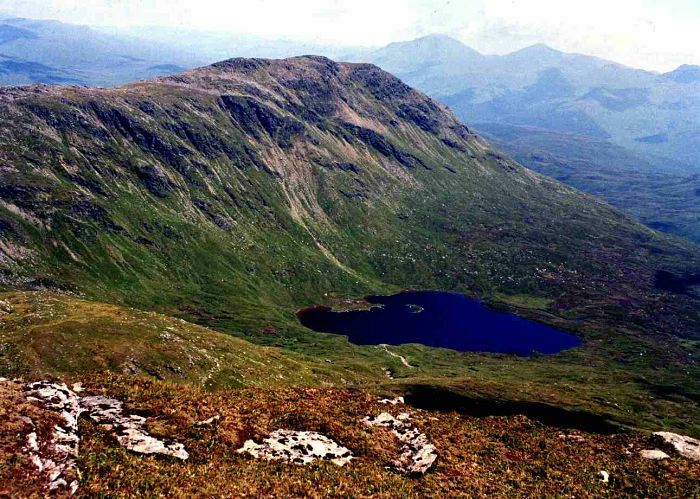 Munros are names that have been given to 284 Scottish mountains over 3000 feet high, and are named after Sir Hugh Munro who surveyed and catalogued these hills, known as Munro’s Tables, in 1891. At a height of 4,406ft (1,344m) BEN NEVIS is the highest mountain in the UK, and only experienced walkers should tackle this one. Because of it’s Northerly latitude, weather conditions can change by the minute. MUNRO ‘BAGGING’ is the name allocated for having conquered a Munro, and is a favourite pastime of competitive hillwalkers as they cross each ‘bagging’ off their list. It’s entirely possible to bag a few in one day. If you are not all that experienced in hillwalking, a good place to start would be CARN AOSDA in Glenshee. Starting from the Ski car park, you’ll find this one quite accessible, and you can probably bag it in an hour. Another favourite with Munro baggers is BEN LOMOND, probably because it is quite close to Glasgow. There are two routes on this one, the tourist route being the easier of the two, and the Ptarmigan route. These are smaller mountains, between 2500 and 3000 feet high, and there are 220 of them. Although not quite as tall as the Munros, and not as much of a target for ‘baggers’ the Corbetts offer a similar challenge to walkers and climbers. The Grahams are the smallest, between 2000 and 2500 feet high, named after Fiona Graham who published her list of 224 mountains in 1992. Although less of a challenge than Munros and Corbetts, these mountains are ideal for the not too experienced. Although the mountains of Scotland are not great in height, in comparison to the Alps, for instance, climbing and walking can be treacherous through exposure to Atlantic weather conditions. Our weather is changeable. You can be basking in sunshine one minute, and facing heavy rain and strong winds the next. (Quite normal). With this in mind, caution is the order of the day, and proper clothing, especially footwear, is essential. You’ll find good deals on Outdoor Clothing & Accessories. In addition to hillwalking in Scotland, there are many coastal and woodland walking festivals. See the Scotland Walking Events page for links to some of the most popular on the calendar. The longest, and most popular and challenging walk in Scotland is the West Highland Way, from Milngavie to Fort William, a distance of 95 miles.